At The Rookwood Inn, we believe love is not just for Valentines (Day)! That’s why we have dedicated the entire month of February to love. With Valentine’s Day almost upon us for many, thoughts turn to romance and love. Romantic love is wonderful and should be celebrated all year round, if you are fortunate to have special person. All February reservations include a half-dozen chocolate dipped strawberries and a bottle of non-alcoholic sparkling cider. If you prefer, we have a few packages packages to help you celebrate your special love. Bring your partner for a mid-week Valentine’s night escape with our Romance Package. We can help you select the perfect place for dinner…a restaurant or you can choose to dine with us (not included in price). 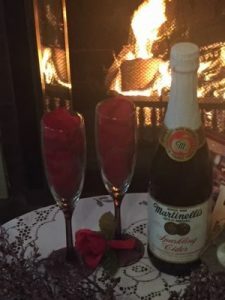 Winter 2019 Romance Packages include flowers, chocolates and a romantic room with or without a beautiful fireplace, and a bottle of sparkling (non-alcoholic) apple cider. All you need do is bring that special person. If you would like, we can even arrange for a couples massage in our spa, for an additional cost. Call us at 413.637.9750 to book your escape today. Valentine’s Day is also the perfect time for a proposal. We can help. Not sure how to pop the question? Ask us and we can help you surprise your “one and only.” We can arrange for a romantic dinner, some bubbly, flowers and even plan how to present the ring. Already proposed and haven’t decided how you want to be married? Innkeeper, Amy, is also a licensed Justice of the Peace and Universal Life Church Minister. 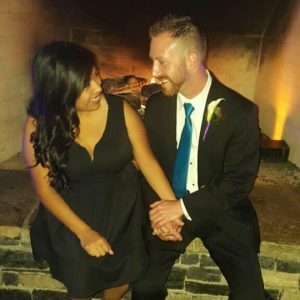 She can help you plan your wedding or elopement, write and perform the ceremony too. Just call her at 413.637.9750. If you’re looking to celebrate a different kind of love, perhaps the love of a good friend or friends, consider a Galentine’s Getaway (not limited to any specific day). Bring your good friends for a weekend (or midweek) of fun. Plan a special slumber party, a baby shower or a bridal shower. We can add our Girlfriends’ Getaway package which includes non-alcoholic sparkling apple cider, chocolates, popcorn and other snacks. Price starts at $15 per person (minimum 4 people). Customize the package by adding spa services, dinner inn or out. For the guys, we can make a special Guys Getaway with your favorite snacks and activities. Just ask and we will coordinate. Are you celebrating your love for a special dog? Did you know that The Rookwood Inn has two first floor rooms which are dog friendly?We lovingly accept dogs over a year old who are fully housebroken, well behaved, under 50 pounds, and current on shots. Bring your fur-baby to enjoy cross-country skiing or snow shoeing or hiking in the beautiful Berkshires. 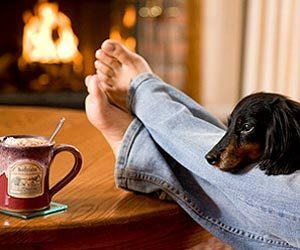 After an active day, spend time cuddling in your room, playing with his favorite toy and enjoying a special treat for you and your dog. Whatever kind of love you wish to celebrate, The Rookwood Inn is here to help you plan that special experience. Call us at 413.637.9750 or book online.